In this final critique of Mass Effect, I will be picking apart the economic systems of the the game. Unlike many games, Mass Effect does not leverage the notion of resource management into a central play mechanic. Even so, there is an internal economy that proves to be fairly complex when pulled apart and interrogated. In this post I use ideas and terminology from theories of conditioning to analyze Mass Effect. See this site for more information on applying behaviorism to game design. One of the things Mass Effect does very well is provide the player with incentive to explore the world, both in the literal sense of navigating and investigating environments and in the more conceptual sense of exploring dialogue options with the various NPCs in the game. There are several positive reinforcers for this behavior on several schedules. Pursuing a conversation for any length of time will net the player “experience points” (XP) which lead to an eventual increase in player level. Within the context of Mass Effect, XP might be considered a primary reinforcer (although clearly, within the broader context of the player’s life it is a secondary reinforcer). Conversations might also result in the acquisition of secondary reinforcers, such as money, items, alignment points, and perhaps most importantly: codex entries. These codex entries are articles in the game’s internal encyclopedia which become unlocked as the player encounters new information in the world. As discussed in the previous critique, the drama of the game revolves around the accumulation of information. As such, perhaps it is fair to say that the codex entries are the primary reinforcer within the game, and that other rewards such as gaining in level are secondary inasmuch as they support the player’s ability to uncover more information. In many cases, the player is prevented from further exploration until some negative stimulus, such as a barrier, is removed. This is one way in which we see negative reinforcement in the game. Mass Effect Critiques #3 – Drama! Comments Off on Mass Effect Critiques #3 – Drama! This post is written in response to the framework for game drama that Marc LeBlanc outlines in his chapter of The Game Design Reader. LeBlanc’s metrics for uncertainty and inevitability seem to be predicated on the notion of the game as a contest . In an RPG this element is often de-emphasized in favor of other types of fun. Certainly there is an aspect of achievement, but this is associated more with things like “collecting X special items”, and “advancing the plot”. In Mass Effect, the bulk of the pleasure is narrative in nature, with significant sub-pleasures for the completionist player, the explorer, and the “min-maxer”. Note that these are not formal play-types, per-se, but they are common within RPG play. Completionists win when there is nothing left to do in the game; explorers win when they have found everything there is to find; and “min-maxers” derive pleasure from the process of character building and skill optimization. When it is present in an RPG, the pleasure of contest takes the form of the player vs. the system, and so it makes sense to look at the game’s combat system as an obvious source of contest and thus drama. 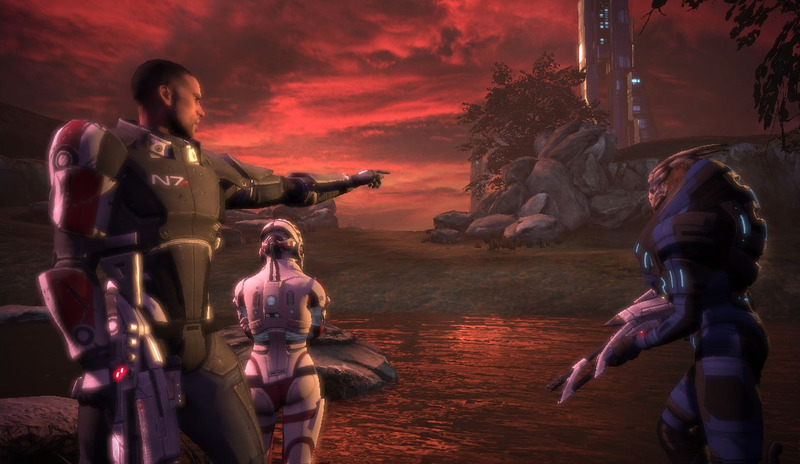 In Mass Effect’s combat system the player’s squad of characters faces off against an assortment of AI controlled enemy characters, deploying various weapons and special abilities until all of the enemies have been killed, or the player’s character runs out of life. Each of these combat encounters might be considered to be a mini-contest-based-drama (or “Play-Centric” drama), from which either side may emerge victorious. However if we step back further from the combat, it is possible to identify a different type of drama in Mass Effect, associated with the narrative notion of “what will happen next?” It is this dramatic tension that drives me to continue playing the game, and I believe that the same systems that govern LeBlanc’s notion of play-centric-drama may be applied fruitfully to this more traditional “narrative-centric” conception. In this post I am going to look at how Mass Effect deals with squad combat. Mass Effect is split between Role Playing mechanics (which revolve mainly around conversations) and Third Person Perspective Squad based combat. As I have advanced through the game I have gotten a better handle on how the combat mechanics in Mass Effect operate, and – in spite of my general dislike of any real time shooter style games where I don’t have a mouse and a keyboard – I am enjoying them. I’m playing catch up, as usual, now that the semester is drawing to a close. Over the course of the last few months I have been slowly playing through Mass Effect as part of my Theory and Design of Games class. While I have not yet finished the game, I have accumulated a handful of interesting critiques of the game, which I have decided to post here. Think of this as an extended review, with occasional theoretical tangents. Where appropriate, I will attempt to point you towards the readings and materials that provided the basis for these analyses. I finished the first draft of the thesis this afternoon. While it is still very rough around the edges and will require significant revision the actual sustained act of creation that has driven me for the last three months is essentially done. I’m going to shift modes from writing to rewriting soon, but for the next day I wish to bask a bit in the realization that I will be finishing this degree on-time, and hopefully making a bit of a contribution to the field in the process. In honor of this occasion I’m going to be posting some excerpts from the writing over the next week, focusing on areas that I think might be of interest to others, and on sections that I think I need critique on. Feel free to sign-up for an account and comment on the material I’m posting here; I am eager for critiques and feedback, especially as I move into editing mode. Interactive Narrative research exists in a rich cross section of disciplines ranging from purely theoretical work arising out of the humanities tradition to the practical applied work arising out of artificial intelligence. There is an ongoing need in this domain to bridge theory and practice. This thesis presents a broad overview of the field in its current state, and proposes three analytical lenses: Believability, Adaptivity, and Performativity. These theoretical tools are intended to support the current generation of work in both sides of the discipline, and draw on ideas both common and uncommon to the domain of interactive narrative research. Using the methodology of close reading, this thesis demonstrates how these three lenses can be used to structure a discussion of the popular computer game, The Elder Scrolls IV: Oblivion. Oblivion is a challenging game to discuss due to its expansive and open ended nature; it is unwieldy when compared to many of today’s games. This work uses these lenses to filter and narrow the discussion of Oblivion to a manageable scale, without robbing it of its richness and complexity. Placing the blame for a quality interactive narrative experience. In a conversation, responsibility for the quality of the experience as a whole is divided between the participants. While it is possible to have an experience that is recognizably a conversation when one of the participant’s language skills are severely limited, it is difficult to consider such a dialog as a quality example of a conversation.